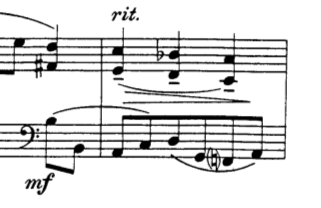 So, what does this tenuto mark mean in Bernstein's piano music? This is a bar from the fifth of Bernstein's Five Anniversaries, "For Susanna Kyle". It's a nice and easy tune that sounds vaguely like what Satie would have composed in his youth were he not wasted all the time. I am wondering what I am to do with those tenuto markings. I would assume that I'd have to let the chords "clash" against each other for a bit, but I'm finding it very weird, and also kind of difficult (not impossible) to do without using the pedal, which, however, would apply to the bass line as well - which I don't think I am allowed to do (besides sounding not too good). I have read and heard that tenuto in context might mean "slight rubato", but it also says (I think) "rit" for "ritmato" (EDIT: no it doesn't, stupid me), which is kind of at odds with the idea of rubato. So, what am I to do with these? In conjunction with the slur and the rit., it means bring out the right hand figure slightly. The slur already specifies that the figure is to be played legato and as a group (which means that the last crochet should probably be slightly detached from whatever follows it, although it will be held reasonably long anyway due to the rit.). From an interpretive point of view, you have a slow down (probably more a short ritardando than a ritenuto), a diminuendo and a descending line, so those three crochets should sound just a touch weighty. Rit is probably ritenuto, an immediate slowing down, as opposed to rubato, and tenuto means hang on for full note value - or even a touch longer: which makes sense as one will make the other happen.So, the whole bar should come at a slightly slower pace than the preceding bars. On the assumption it's written in C at that point - I'm guessing - you can play the first pair of notes, change finger on the lower one, to get to the middle pair smoothly. Then do the same trick again, obviating pedal usage. Think how you would normally play a phrase of three slurred notes. The first with a slight accent, then a diminuendo to a slightly shortened final note? The tenuto marks are telling you NOT to do this, but to give each note equal and ample weight. Not the answer you're looking for? Browse other questions tagged piano notation articulation expressiveness or ask your own question. Isn't a tenuto marking redundant? What does an arc mean above the notes in a piano sheet music? How do I play it? What does this split stem notation mean? What does this note - B# - mean? What does this indication mean? What does this notation mean for the piano? What does “Mm.” in this case mean? What does this wavy line mean in piano? What does +- mean in piano music? What is this articulation mark that looks like a short upside-down slur?